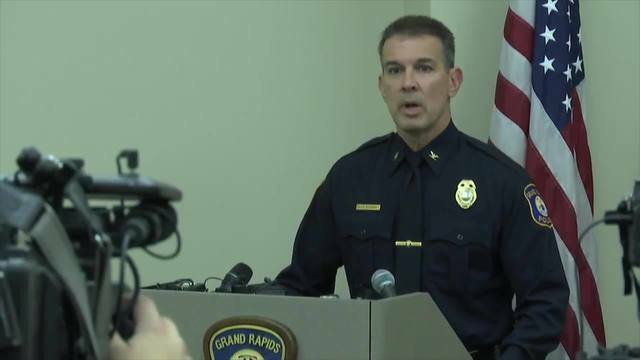 GRAND RAPIDS, Mich. (WOOD) — Grand Rapids Police Department Chief David Rahinsky says officers who briefly handcuffed a 12-year-old black child while investigating a report of a shooting followed their training. But Kent County Commissioner Robert S. Womack disagrees. "Our chief has made a terrible mistake that we are going to agree to this as normal behavior," Womack stated in a Tuesday Facebook post announcing his plans to hold a protest march. During the Tuesday news conference, Rahinsky played a recording of the 911 call that led to the response. GRPD altered the caller's voice to protect her privacy. The report turned out to be bogus, but while investigating, officers called out the family that was inside the home the caller described.